The government stands accused of failing to recognise and address the seriousness of the science teacher shortage in England's schools. Ministers suggest they are on top of the issue by claiming 7,500 science teachers were hired in a single year. But science campaigners say the claim is misleading because it includes those teaching many more subjects than physics, chemistry, biology and maths. 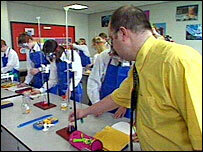 The government said science teacher numbers were up 30% since 1997. The Campaign for Science and Engineering (Case) claims, in a report, that the government fails to appreciate how severe the situation has become. Case assistant director Dr Hilary Leevers said: "We were alarmed when Tony Blair recently expressed optimism that 7,500 new science teachers had been hired in a single year. "In fact 7,500 teachers had started teacher training courses in all subjects counted as Stem (science, technology, engineering and maths)." But as Case points out Stem subjects also include design and technology, information and communications technology, business studies, graphics, textiles and food technology. Dr Leevers said: "People signing up to start a textiles teaching course were being hailed as new classroom teachers." Clarification of the figures quoted in Mr Blair's November speech entitled Our Nation's Future - Science was sought by Dr Brian Iddon MP. He was told in a Parliamentary written answer from schools minister Jim Knight that they related to the number of teachers registered to enter initial teacher training courses in 2005. Figures obtained by Case reveal that only half as many chemistry, maths, physics and biology specialists were registered on teacher training courses in 2006 - the first year for which breakdown by subject is available. Dr Leevers said: "In 2006, there were just 350 teacher training recruits who were physics specialists. "A lot are expected to drop-out before they reach the classroom and two-fifths typically leave within the first five years. Out of the original 350, that will leave fewer than 200 new physics teachers." "Frankly, we're tired of complaining that 25% of schools do not have any specialist physics teacher, and there are worrying shortages in chemistry and mathematics too. "A million children are being taught physics by people who are not physics teachers. It's not fair on the children, it's not fair on the teachers and it's bad for the economy," she added. The campaigners welcome the increase in "golden hello" payments designed to attract teachers into subjects where there are a shortage of specialists. But they argue that bigger steps need to be taken. Case is calling for there to be targets for the recruitment of physics and chemistry teachers instead of a general science target. It also wants to see ring-fenced funding provided for teachers to be retrained in shortage science subjects. "Currently, many teachers cannot take advantage of training because there is no funding for teaching cover," Dr Leevers added. "Ministers are happy to talk about all the fantastic schools science clubs and centres and other initiatives that have been set up. "Many of these are great, but they are not going to affect the many children in those state schools that are not taking part." A spokesman for the Department for Education and Skills said 120,000 more young people are studying for science related degrees than in 1997-98. "Thanks to generous bursaries there has already been a 30% increase in the number of new science teachers since 1997 and the number of physics teacher trainees has doubled in the last few years." He added that £30m would be spent over the next two years to help recruit 3,000 extra science teachers and encourage more young people to study the sciences. The science curriculum was being changed to give more pupils the chance to study physics, chemistry and biology separately and more people with industry experience in science and engineering would be working with teachers and young people.